Do you often have to loosen your clothes and unbutton your pants after a meal? You’re not alone. According to statistics, a massive 10 to 30% of the general US population regularly suffers from bloating 1, a condition in which the tummy feels full and tight and may or may not be distended. 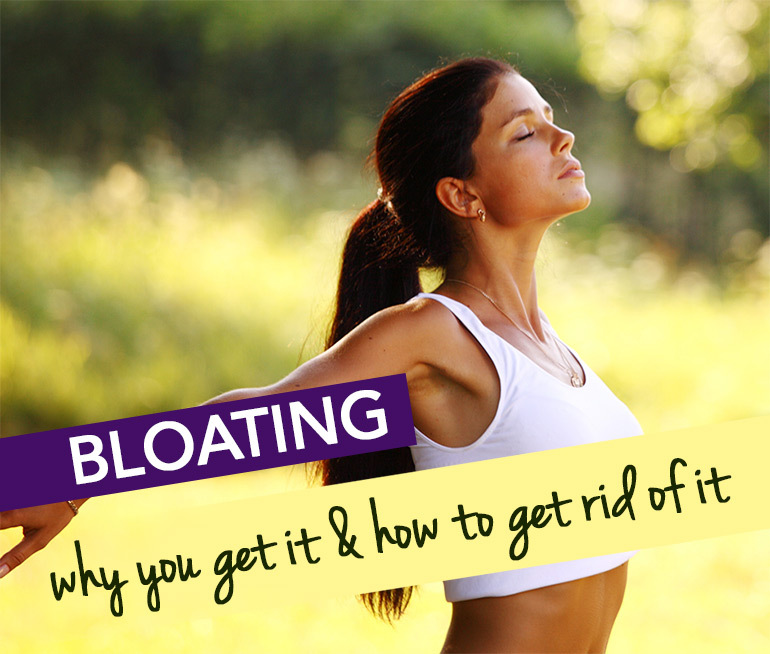 The good news is that bloating can be easily prevented in most cases. We give you some of the common causes of bloating to help you identify what may be triggering the symptoms and show some easy fixes. A major cause of air swallowing, rushing through meals (as most of us do) not only increases the amount of air we swallow but also seriously impairs digestion. Digestion starts when you see, smell or think about a food – your mouth ‘waters’, production of stomach acid is triggered, the small intestines get ready for peristalsis and so on. When you rush this process, you’re forcing your gastrointestinal tract to deal with the food before it’s ready to deal with the complex process of digesting a meal. And while you may love surprises, your digestive system sure hates them. When we chew food, it gets mixed with saliva – this process makes it easier for the stomach to turn the food into chyme, a semi-liquid food mass that contains enzymes and hydrochloric acid. This is propelled via the pyloric valve into the duodenum, the beginning of the small intestine. Chow down your food and you don’t have a chance to chew your foo properly, so it arrives in your stomach in big lumps and wont be properly broken down into chyme, leading to indigestion and bloating. Since fat takes longer to be digested compared to carbs and protein, a high fat meal will slow down gastric emptying, making you feel full (and round). Humans like sugar and so do bacteria. Whenever you eat a sugar rich food, the bacteria in the gut feed on it and produce gas 3.
ever heard of xylitol, erythritol, sorbitol, maltitol or mannitol? These sugar alcohols aren’t easily digested, and can cause gas, bloating, cramping and diarrhea in some people 4. Beans are rich in undigestibale sugars (raffinose and stachyose), causing gassiness and bloating. These sugars pass through the small intestine undigested and reach the large intestine where they are digested by bacteria 4. Unfortunately, bacterial fermentation results in gas production. Asparagus and cruciferous veggies like broccoli, cauliflower, Brussels sprouts, kale and cabbage contain sulfur and indigestible sugars like raffinose, which also promote gas formation 4. Bloating may occur when gas formed during digestion gets blocked behind slow moving stool and builds up 5. SIBO is a condition in which a large number of bacteria usually found in the colon infiltrate the small intestine and metabolize carbohydrates (sugars) 6. Depending on the amount of bacteria, this can lead to an excess of intestinal gas, bloating and abdominal distention, diarrhea, pain or discomfort, fatigue, and weakness. Learn more about the many health benefits of friendly bacteria and what happens when your gut bacteria are out of whack. The two most common types of IBDs are Crohn’s disease and ulcerative colitis. In IBD, chronic inflammation usually leads to intestinal swelling and scar tissue formation. The ‘blockage’ that arises can cause bloating due to bacterial fermentation. When the small intestine does not produce enough of the enzyme lactase, the body cannot properly digest lactose, the natural sugar found in milk. The result is that the lactose moves to the large intestine without being properly digested and once there, it is feasted upon by the bacteria present. The gas produced by our little bugs usually causes pain and bloating depending on the extent of lactose intolerance. Beat gassiness and belly bloat, and feel flat again with the following tips. 1. Start by keeping a ‘bloat’ diary. Everything you eat or drink (including amounts) – this can help you identify whether your bloating issues are triggered by something you consume or how much you ate. Where you ate or what you were doing while eating or drinking (talking on the phone, watching TV, working on some urgent case) – multitasking while eating can hamper digestion. How you felt before eating – were you unconsciously stressed out about something? Remember that stress is known to impair digestion. Was your stomach already upset? Whether or not you felt bloated after eating or drinking. Set aside 20 to 30 minutes to eat. I know you’ve got to work but remember that the smoother your digestion goes, the more you’ll be able to focus on your work (instead of the balloon-like belly). Focus on your food (your Facebook status update can wait) and savor every bite of it. You may also find it easier to allocate a specific eating zone – that bench in the park for instance. That way you’ll get to de-stress while nourishing your body. Put down the fork and knife between the bites even if you’re eating alone. Decide on a minimum number of chews per bite – try it and note down how that feels. If you find yourself eating like it’s your last meal, it’s okay. Put down the utensils, close your eyes and focus again on slowing down the pace. You can stick a note on the fridge if that can help. Make sure you’re drinking enough water especially if you’re on a high-fiber diet – patients often report an improvement in their symptoms when they watch their water intake. Try to get at least two portions of leafy greens per day. Have 3 to 5 natural prunes daily – these fruits are known to stimulate gastrointestinal muscle contractions. Be active daily – there’s no need to hit the gym; just keep moving. Instead of canned beans, try dried ones. Allowing the beans to soak in water overnight or for 24 hours facilitates digestion and reduces gas production. Bonus: dried beans are way tastier than the canned versions. If using canned beans rinse them first. Keep eating your greens. Start by consuming a small portion of cruciferous veggies along with other greens. You may find that they are easier to tolerate if you cook the cruciferous veggies slightly. Add bay leaf, rosemary, and ginger to meals rich in beans or cruciferous vegetables and beans. They can help break down the indigestible sugars, helping reduce gas and bloating. If you’ve cut out dairy, gluten or sweeteners, chances are you’ve probably not even thought to look at your multivitamin. Supplements often contain additives, binders and fillers such as lactose, soy or wheat, or sweeteners like xylitol, sorbitol, or mannitol. Look for a multivitamin that contains few extra ingredients, preferably one without any additives or fillers. Try to skip supplements that contain sugar alcohols, lactose, or gluten. Look for ingredients like wheat germ, “modified food starch”, or “hydrolyzed vegetable protein” if you have a sensitivity or intolerance to gluten. Though troublesome ingredients might not be listed at all, as supplements aren’t regulated by the FDA, which means that all the ingredients may not even be on the label. Go for a higher-quality supplement. And if you’re still having trouble, get your daily dose of vitamins and minerals by eating a healthy and varied diet packed with whole foods. Studies show that peppermint can sooth intestinal muscles, allowing painful digestive gas to pass. How to take: Steep 1 teaspoon of peppermint leaves in boiling water for 10 minutes. Strain and allow to cool – drink 4 to 5 times per day between meals. Help to relax the colon and exert a soothing effect on the digestive system. How to take: Either chew a pinch of fennel seeds or allow them to steep in hot water for 5 minutes; strain and drink the infusion. Exerts a calming effect on the gut and has been used traditionally to relieve symptoms of bloating. How to take: Allow a teaspoon of freshly grated ginger to steep in hot water or green tea for 3 minutes. Strain and drink while warm. If you suffer from allergies, food intolerances, or intestinal disorders, talk to your physician or dietitian. If you’re suffering with bloating on a regular basis or have other symptoms, speak to your doctor. Thompson WG, Longstreth GF, Drossman DA, et al. Functional bowel disorders and functional abdominal pain. In: Drossman DA, Talley NJ, Thompson WG, Whitehead WE, Corazza GR, editors. Rome II. Functional Gastrointestinal Disorders: Diagnosis, Pathophysiology, and Treatment. Second edn. Degnon Associates, Inc; Mclean, VA: 2000. pp. 351–432. Fernández-Bañares, F., Rosinach, M., Esteve, M., Forné, M., Espinós, J. C., & Maria Viver, J. (2006). Sugar malabsorption in functional abdominal bloating: a pilot study on the long-term effect of dietary treatment. Clinical Nutrition, 25(5), 824-831. Jones, M. P. (2005). Bloating and intestinal gas. Current treatment options in gastroenterology, 8(4), 311-318. Thomas, B. (2001). Manual of dietetic practice (No. Ed. 3). Blackwell Science. Shen YH, Nahas R. (2009) Complementary and alternative medicine for treatment of irritable bowel syndrome. Can Fam Physician. ; 55(2):143-8.